December 13th is Sankta Lucia Day! For those of you who may not know, I come from a long line of Swedes on my mom's side. 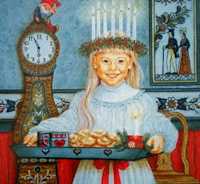 And this is a holiday celebrated in Scandinavia, traditionally with a procession of children led by the Lucia singing this traditional song.